LIttle Women Throat I Throat AUM Fidelity 2011 PART OF A GRAND PRIZE BUNDLE -- $75 TO ENTER TO WIN! David S. Ware / Planetary Unknown Processional 3 Live at JazzFestival Saalfelden 2011 AUM Fidelity 2012 (POSSIBLY) YOURS FOR A PLEDGE OF $15! Samadhi Fall Out Masahiko Meets Gary Express 1972 from the D:O RADIO premium !! Darius Jones Quartet Roosevelt Book of Mae'Bul (Another Kind of Sunrise) AUM Fidelity 2012 part of today's grand prize booty! Farmers by Nature Out of This World's Distortions Out of This World's Distortions Grow Aspens and Other Beautiful Things AUM Fidelity prize!! Jeff Davis Leaf House Leaf House Fresh Sound New Talent 2012 prize !! pledge of $15 and you're in the running!! Luce Trio Lascia Ch'io Pianga Pieces, Vol. 1 Musaeum Clausum 2012 prize!! Masayuki Takayanagi What Have We Given? April Is the Cruellest Month ...from the D:O Radio preeeeemeeeee-um. David S. Ware Organica 2 Organica AUM Fidelity 2011 prize!! Akira Miyazawa Nijimasu 1 Nijimasu Nippon 1970 premium cut from the D:O Radio premium, Made in Japan. Chances of winning? EXTREMELY GOOD. JUST GIVE $15 (or more)! Thanks! See you at noon! destination:marathon! good monday, gents, and good luck! Way to ease into the show. I've never seen my manatee swim so fast. Yo, D-O. Hope you rake it in! seems like we're listening to the opening again? a ha, the mystery revealed! everybody pledge and make the odds of winning smaller!! Some dulcet tones to kick things off. What you're hearing now is from the grand prize. All pledges of $75 or more — for which you automatically get Destination Out's amazing premium — will be in the running. I'll try to be back. I have a gauntlet to run at work today. Guantlet. Is that, like, a baby gaunt? Thanks, LJfW, Fred, duke, Uncle Michael, Carmichael! Might be a bit tardy with the commenting today. I'm not used to talking and typing at the same time. This Planetary Unknown record is exceptional - a D:O pick for one of the best of 2012. Yours for a pledge! 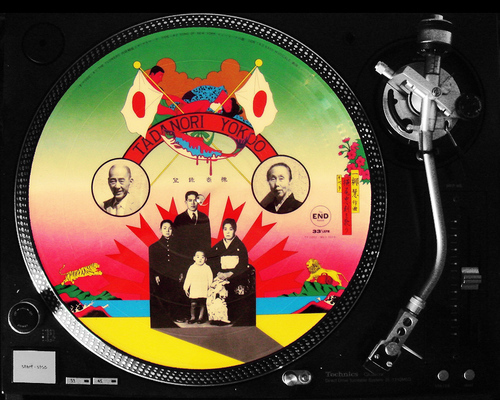 $75 pledge gets you our MADE IN JAPAN premium- jaw-droppingly great tracks from Japanese jazz musicians. A wide range of rounds from extremely rare records. All killah, no fillah! You can try and go 2 for 2, Fred!! Well understood, Fred. Well understood. Only three (three wonderful) pledges in so far. Please come out and support the show. Kondo shared a bottle of red wine with me a few years back. Nice guy! If we get five "premium size" pledges today, Jeff G has agreed to do the next show entirely in Japanese - or a language of the commenters' choosing. A chance to hear his mad phonetic skillz in action! Did he then play the empty bottle, Hugo? Very cool, Hugo. You have any particular favorite Kondo albums? He occasionally sounds like he could have. I'm mostly familiar with his work with Brötzmann, so this gig was with the quartet, Hairy something. They shoot Jeffs, don't they? That's why we feel safer traveling in packs, Uncle Michael. Pledge now - and make this feel less like a dance marathon for Jeff G and Doug. For a premium level pledge, they'll show you their gams! WFMU...the GIG that keeps DJs YOUNG...but not creepy or mercenary. Well, maybe a little creepy. In a good way. I listen on my android phone through my car stereo all the time. Jeff, if we knew you were coming here to Jersey, we would have tidied up a bit, maybe. Love you just the way you are, bgporter. I went to see Colin Stetson last night. Abslutely amazing! I've never heard anyone play the alto and bass sax like that before. He's currently on a European tour, but will be playing stateside in May. New York, Pittsburgh etc! Recommended! I'm in the running for the Grand Prize -- very glad not to have D:O Radio two weeks in a row. PS Stetson is coming through Philadelphia in May. He has a duo out with Mats Gustafsson which is different from what he does solo. Infinitely more screechy. Discovered D:Out a couple of weeks ago, and a blast of creative music can be very refreshing. Just pledged too. Keep it going! His (Stetson's) solo stuff on recent CDs is intense. His solo playing got me thinking of Terry Riley at times. aw, you make-a me blush, doug! Gotta go but this has been great and just wanted to say thanks to Doug and the Jevvs for D:O Radio. have a good one, shaun! howdy, brian! Hey james, Thursdays shift should be fun with YLT playing live. indeed. never been there during their annual visit. it'll be interesting to see what sort of requests come in. only bummer is i wasn't free earlier this week so i could head to jc and say howdy in person to the mighty doug himself! Last chance to get the MADE IN JAPAN premium and get in the running for the grand prize - 3 great albums from AUM Fidelity: Darius Jones's Book of Mae’bul, Grass Roots's s/t, and Little Women's Throat. Thanks to everyone who's pledged so far! Hey Doug, are jumping a west bound freight after the show. james they are in Berlin on Thursday I believe. Enjoyed the show today Jeffx2. I will be doing my regular Tuesday evening show from New Jersey, then hitting the westbound train on Wednesday. Thanks so mcuh, Uncle Michael! Doug, catch the first thing smokin'. that's what i always say: three hours already?! Six hours, that's just warming up for Doug.